So I ran a forum search and couldn't figure this out...so here I am asking for help, lots of questions but one main idea - what is an SUL really? : What is the difference between an indoor quad and an SUL? What makes an SUL different than a standard? Can I take a standard and change/tweek some stuff and end up with a SUL sail - or is the sail itself too heavy or is the sail geometry different? Is an SUL just an indoor flown outside when there is no wind?? I know that there are times when there is not enough wind to keep my standard afloat without lots of work....and that is ok. But I keep hearing about SUL but I don't know what that really means. Not looking for an equipment fix to the no wind issue, just trying to educate myself as to what the consensus is on terms. We're pleased to yet again announce the next prize being given away to our most appreciated supporters, the Kitelife Subscribers... For roughly 10 cents per day they play a major role in keeping KL growing in every way. Your very own CUSTOM REVOPOLO, almost a $400 value donated by @Polo to celebrate the reopening of Polo Kites - the winner will be able to arrange their own colors in any style! 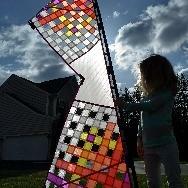 This package includes your own custom designed kite and a sleeve! == Remember, you must have an active KiteLife subscription to be entered, but you can sign up here! Odds of winning for this prize is currently 1/358, and will be drawn on Feb 15th, 2018! Our thanks, and the very best to you... Let the drooling begin!